Lionel Messi only picked up a knock in Sunday's 6-0 win over Athletic Bilbao, his club Barcelona have said. The 28-year-old Argentine, who missed two months this season with a knee injury, was replaced at half-time as a precaution, having scored the opener. "Medical tests on striker Lionel Messi this Monday morning have revealed great news," a Barca statement read. "It turns out that the Argentine has not got a hamstring injury and has just taken a bit of a knock." 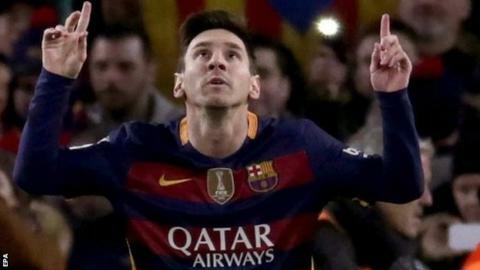 Barca say it is uncertain whether Messi will play on Wednesday, when they play Athletic again - this time in the Copa del Rey quarter-finals.